As social animals, both human and non-human primates have developed excellent skills in recognizing and discriminating a wide variety of faces. Accordingly, one of the most active fields in systems neuroscience is to understand the neural mechanisms underlying face processing. Revealing these mechanisms is important not only for understanding how the brain processes complex stimuli, but also for developing better treatment for neurological and psychiatric disorders, such as prosopagnosia (inability to recognize faces) and autism (with the face perception deficit as a core symptom). Previous studies have identified multiple face-selective regions in the temporal and frontal lobes, which respond more strongly to faces than non-face objects, as well as multiple face-responsive regions (e.g., the amygdala), which may process changeable aspects of faces (e.g., facial expression). 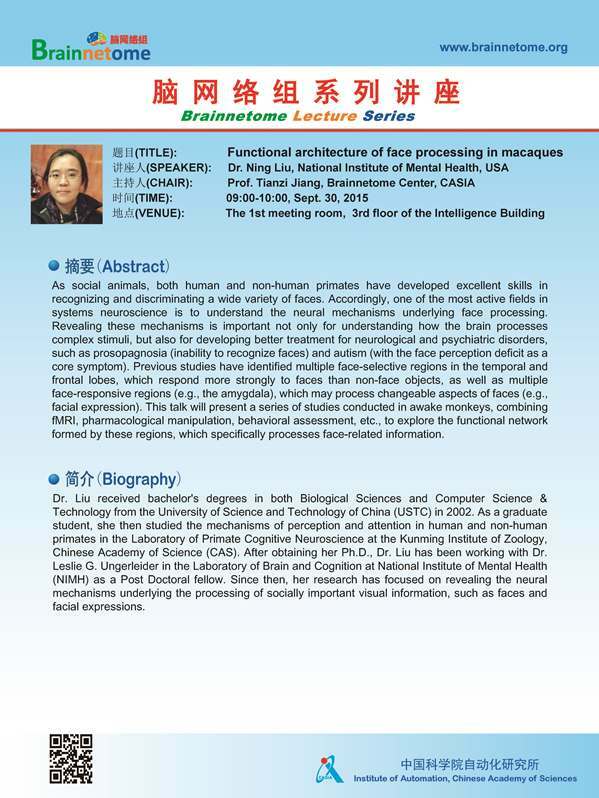 This talk will present a series of studies conducted in awake monkeys, combining fMRI, pharmacological manipulation, behavioral assessment, etc., to explore the functional network formed by these regions, which specifically processes face-related information. Liu N, Hadj-Bouziane F, Jones KB, Turchi JN, Averbeck BB, Ungerleider LG (2015) Oxytocin modulates fMRI responses to facial expression in macaques. Proceedings of the National Academy of Sciences of the United States of America 112:E3123-3130. Liu N, Kriegeskorte N, Mur M, Hadj-Bouziane F, Luh WM, Tootell RB, Ungerleider LG (2013) Intrinsic structure of visual exemplar and category representations in macaque brain. The Journal of Neuroscience 33:11346-11360. Hadj-Bouziane F, Liu N, Bell AH, Gothard KM, Luh WM, Tootell RB, Murray EA, Ungerleider LG (2012) Amygdala lesions disrupt modulation of functional MRI activity evoked by facial expression in the monkey inferior temporal cortex. Proceedings of the National Academy of Sciences of the United States of America 109:E3640-3648. Nasr S, Liu N, Devaney KJ, Yue X, Rajimehr R, Ungerleider LG, Tootell RB (2011) Scene-selective cortical regions in human and nonhuman primates. The Journal of Neuroscience 31:13771-13785. Dr. Liu received bachelor's degrees in both Biological Sciences and Computer Science & Technology from the University of Science and Technology of China (USTC) in 2002. As a graduate student, she then studied the mechanisms of perception and attention in human and non-human primates in the Laboratory of Primate Cognitive Neuroscience at the Kunming Institute of Zoology, Chinese Academy of Science (CAS). After obtaining her Ph.D., Dr. Liu has been working with Dr. Leslie G. Ungerleider in the Laboratory of Brain and Cognition at National Institute of Mental Health (NIMH) as a Post Doctoral fellow. Since then, her research has focused on revealing the neural mechanisms underlying the processing of socially important visual information, such as faces and facial expressions.